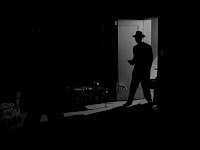 Noir 101. The Essentials. Crime Wave. 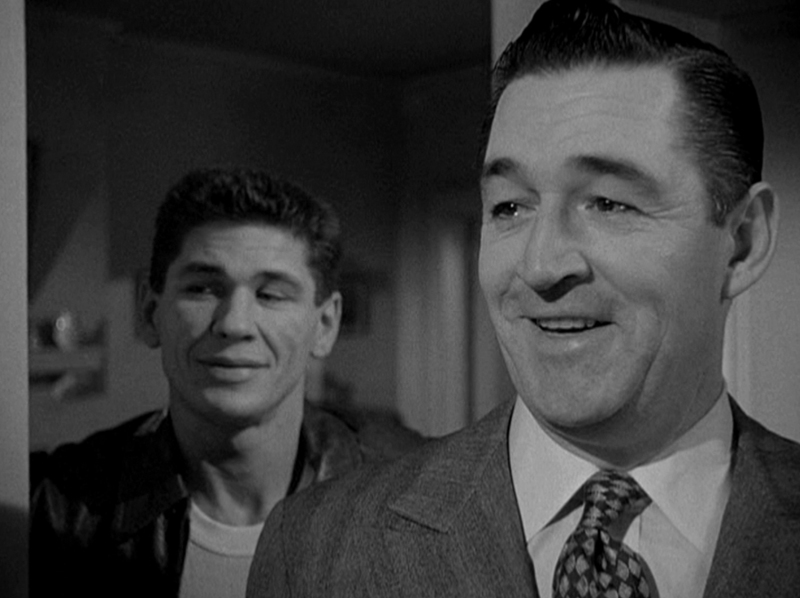 If this little policier from Warner Bros. (filmed in 1952, released in ’54) isn’t part of your vocabulary then it needs to be; and considering it was finally released on DVD a few years ago, there’s no excuse not to see it. Crime Wave doesn’t stand out from a narrative point of view (despite a bucket of writers); the plot is routine, like a million other second features cranked out during the fifties. Although the story and characters are heavily steeped in noir tropes, it’s André De Toth’s sharp direction that sets it apart from other low budget crime pictures and demands that it be seen by any enthusiast. 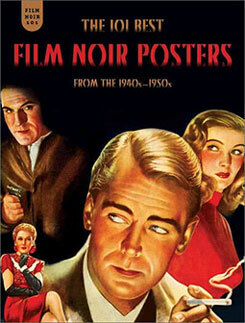 It can be argued that no other film noir is as influential as it is unknown. The story is old hat: Ex-con tries to go straight. His old crew breaks out of the Q and comes knocking. When he refuses to help, they hold his fresh new wife in order to force him to take part in one last caper. All the while, the cops are along for the ride, except they don’t believe for a second that our boy is on the up and up. The cast here is special, and although Sterling Hayden isn’t (necessarily) the protagonist, he dominates the film. This is the sort of role the movie gods had in mind when they placed Hayden in front of a camera: LAPD Detective Lieutenant Sims, bigger and tougher than any of the hoods in the mug book. For my money this is the role of Hayden’s career — not the meatiest or the most well known, but the one in which he leaves the impression of having been the part, rather than merely having played it. (Put it this way: during the DVD commentary, author James Ellroy asserts that Hayden in Crime Wave simply is Bud White.) 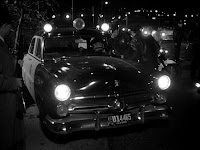 There are those that prefer him in The Asphalt Jungle or The Killing, but Hayden has a distinct vibe as a cop that isn’t there when he’s playing a crook: you can cross to the other side of the street and dodge a hoodlum (and it isn’t like you won’t see Hayden coming a mile away) but you can’t avoid the police. With the force of the law behind him, the prospect of cop Hayden looking for you is scary as hell. 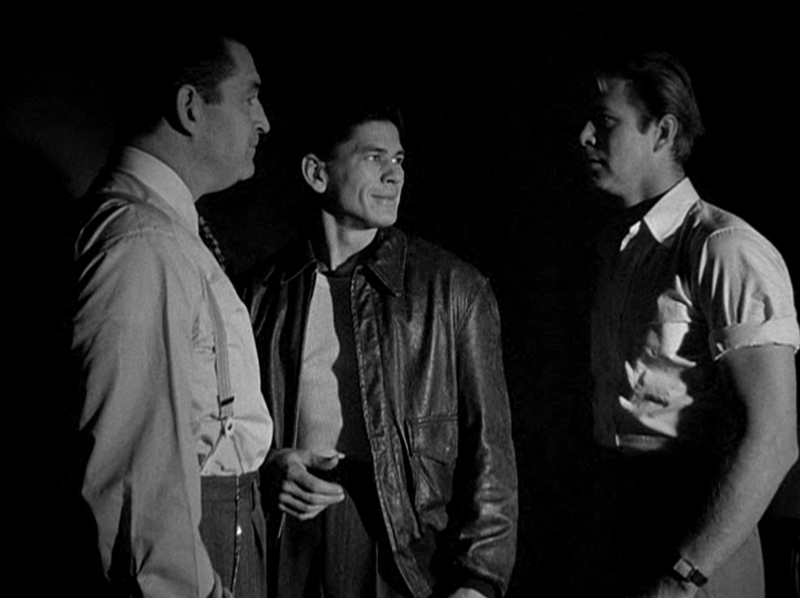 At a beefy six-and-a-half feet tall, Hayden towers over everyone else in the film. 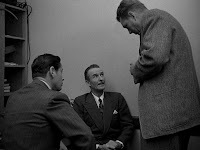 André De Toth and cameraman Burt Glennon keep the camera low, catching the big fellow from underneath but look down on all of the other actors, as if from Hayden’s point of view. He has to slouch, unkempt, a toothpick in his mouth, scruffy hat, tie perpetually twisted backwards — almost too big to be allowed. The film has numerous stellar sequences, but for Hayden one in particular stands out; it begins at around the eleven-minute mark and finds the cop in his homicide division office, interviewing an eyewitness about the Quentin breakout suspects. The scene opens with him at his desk, then it follows him around the bureau, hovering shark-like over a half-dozen routine interviews going on around the office. Ostensibly the purpose is pure semi-documentary storytelling, providing audiences with an up-close look into the inner workings of the LAPD: A middle-aged couple is extolling to one cop about how she and her guy (replete with bandages head) don’t really fight — she didn’t mean to conk him, they were just kidding around. At the next table, a hang dog B girl dripping with mascara and dime-store jewelry sobs about some chucklehead boyfriend from her past, while at yet another a career stool-pigeon chastises a junior man about bracing him in front of his neighbors. What makes the whole thing work is the extraordinary authenticity: pay attention to what is going on in the frame away from subject, almost as if the extras forgot for a moment the cameras were rolling. 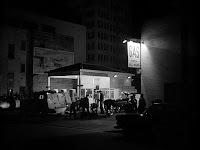 And this ain’t no soundstage — most of the scenes in Crime Wave, interiors and exteriors alike, are filmed in real Los Angeles locations. 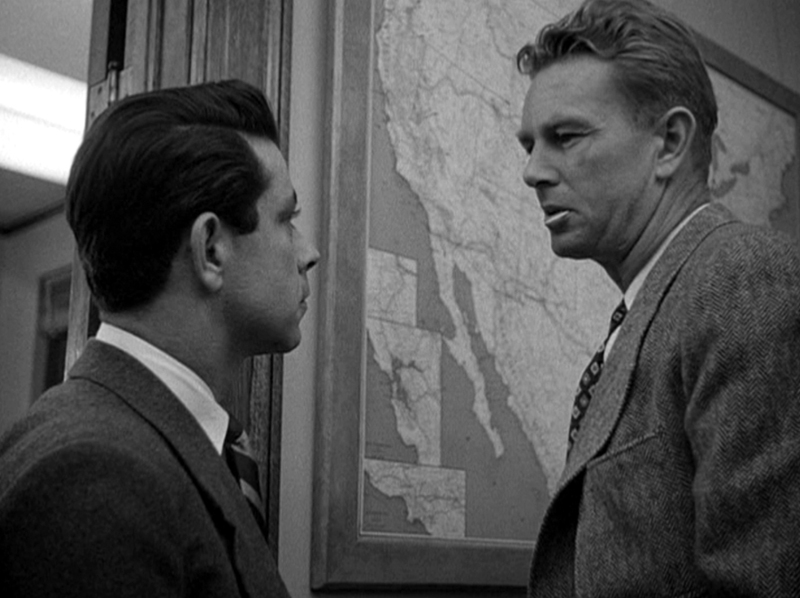 And if Hayden wasn’t so utterly believable as a LAPD homicide detective, circa 1952, none of it would work — he’s the glue that holds the entire movie together. If part of the allure of these old films is seeing things as they actually were way back when, this is a scene (and a film) that will keep you in goose bumps. Then there’s Gene Nelson, of nimble feet and Oklahoma! fame, who plays Steve Lacey, ex-con. It’s on the plus side how Nelson underplays his part. His performance doesn’t offer much beyond matinee good looks and rolled up shirtsleeves. Like I said, this is Hayden’s movie, and Nelson keeps his character plenty quiet. Whether it was his idea or De Toth’s, Steve Lacey is Lieutenant Sims perfect foil. 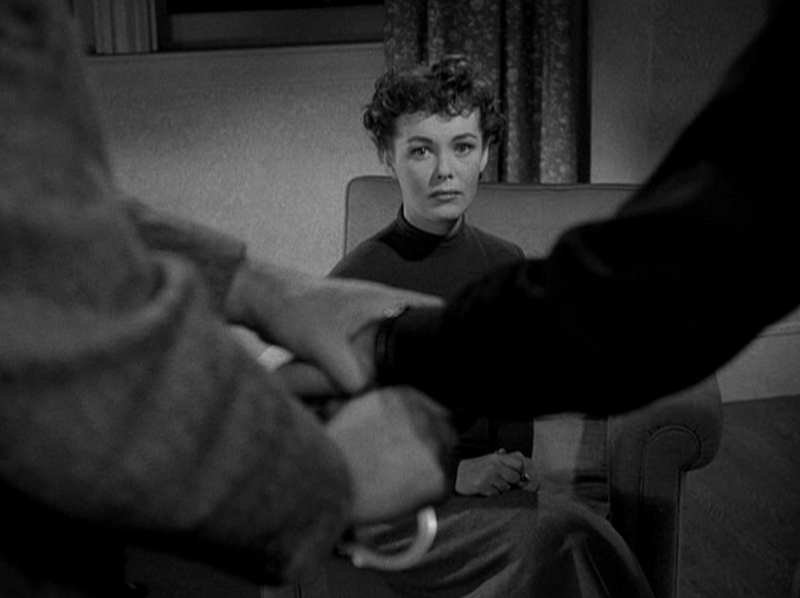 From a noir perspective, Lacey is a protagonist in the classic mold: trying to make good after doing some hard time: employed, married, and with a permanent address. 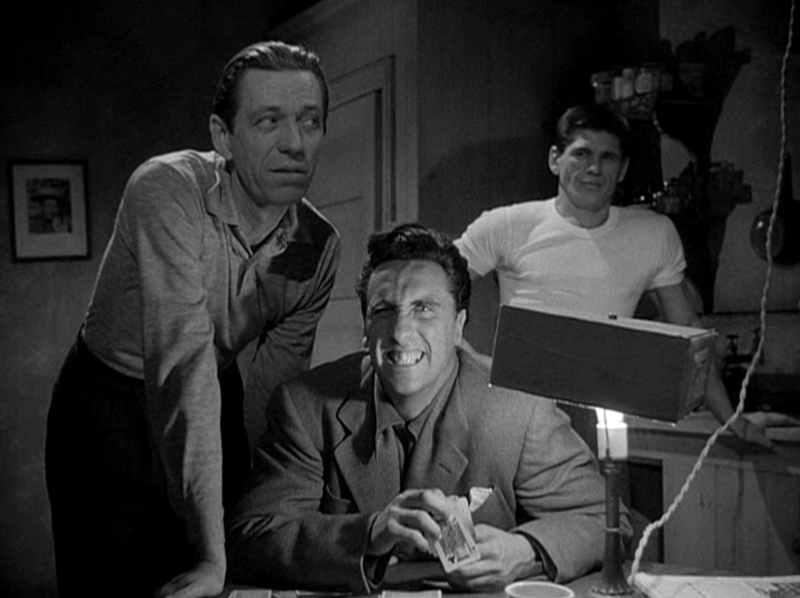 Crane Wilbur’s story puts him in the classic fix: when his old cellmates come looking for help, he knows that refusing them puts everything he’s worked for at risk, while anything short of dropping the proverbial dime puts him squarely on the wrong side of the law. Damned if you do, damned if you don’t: the rock and the hard place of classic film noir, with only fate to decide whether or not a man comes out clean on the other side. The wife is model-turned-actress Phyllis Kirk. Kirk did most of her work on television, but if you remember her at all it’s probably as the damsel in distress in André De Toth’s most famous picture: House of Wax. 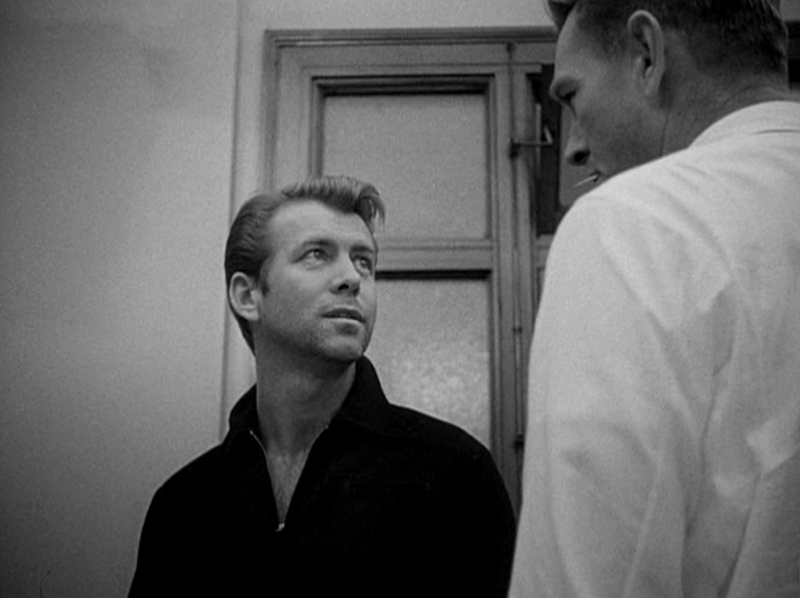 Kirk and Nelson are well matched — and the mature depiction of their relationship is surprising for a film noir, and rather progressive when we consider typical gender depictions in similar crime films. Ellen Lacey wears the pants in the family; her assertiveness perfectly balances her husband’s diffidence — yet she’s neither a nag nor a shrew. Steve Lacey’s time behind bars has wrecked his ability to function outside the walls. He needs this strong woman to prop him up and constantly assure him that better days lie ahead. That he had been, of all things, a fighter pilot during the war especially heightens the unusual nature of their relationship. Gone is the recklessness and bravado typically found in screen characterizations of such men, while the wife is equally surprising — a strong, modern woman who is neither a femme fatale nor June Allyson clone. The film gives us an ideally matched couple, each possessed of what the other needs. The crooks. Ted de Corsia: Eddie Muller says he looks like he was born in a boxing gym. 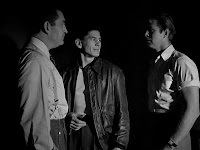 James Ellroy: he “oozes Pomade.” Iconic in The Naked City, de Corsia shines reliably here as the brains behind the breakout. 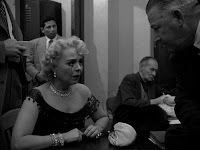 Crime Wave’s theatrical audience was familiar with him in heavy roles dating all the way back to The Lady from Shanghai. De Corsia’s screen persona was as hard-boiled as they come, think of him as an old-school Raymond Burr. His young partner is Charles Buchinsky, who also worked for De Toth in House of Wax. Of course Charles Bronson would go on to be one of the icons of seventies crime films, and one of the biggest movie stars in the world. It’s always jarring to see him this young, his face somewhat lined, but nowhere near as weather-beaten as it would soon become. 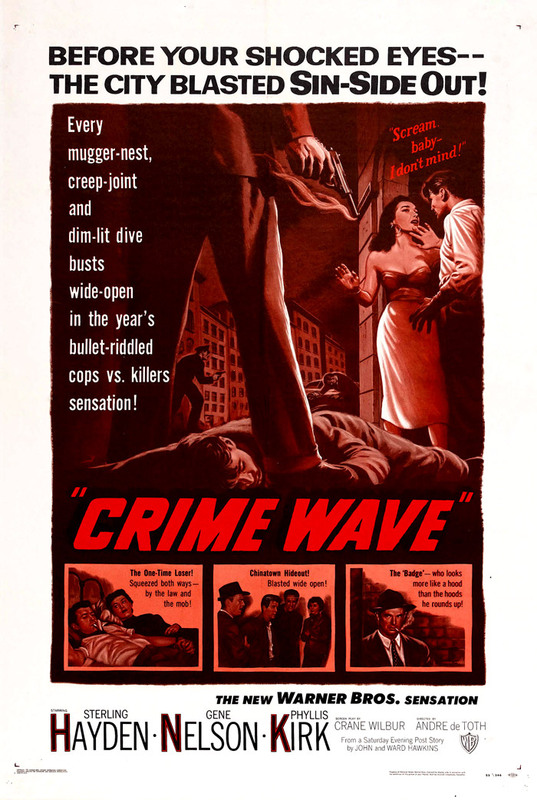 Crime Wave offered the young actor one of his best early roles: he actually gets to act a little here, and even has a few moments where his physicality is on display. The juxtaposition of a studio era character actor as old school as de Corsia with someone as contemporary as Bronson is yet another reason to examine this film. Then there’s Tim Carey, one of the wild men of the American movie scene. There’s not enough room in any film review to dig into the strange case of Tim Carey, though on the strength of his appearance alone this one is worth the price of admission. His few brief moments of screen time are so bizarre — whether he’s at the center of the shot or mugging from the corner of the frame — that Crime Wave would be notable if for no other reason. Enough about the cast, as good as they are, there are more worthwhile reasons to watch this, especially if you appreciate how a film looks, even more if you can feel a film. Usually when a noir essayist digs on cinematography, they’ll discuss the lighting and composition of individual shots — I’m not going to do that. From top to bottom, Crime Wave is a beautifully and thoughtfully staged movie, yet it’s not a one-trick-pony when it comes to visual style (dig, Witness to Murder). Instead, it’s a movie that employs a variety of techniques depending on what individual scenes call for. 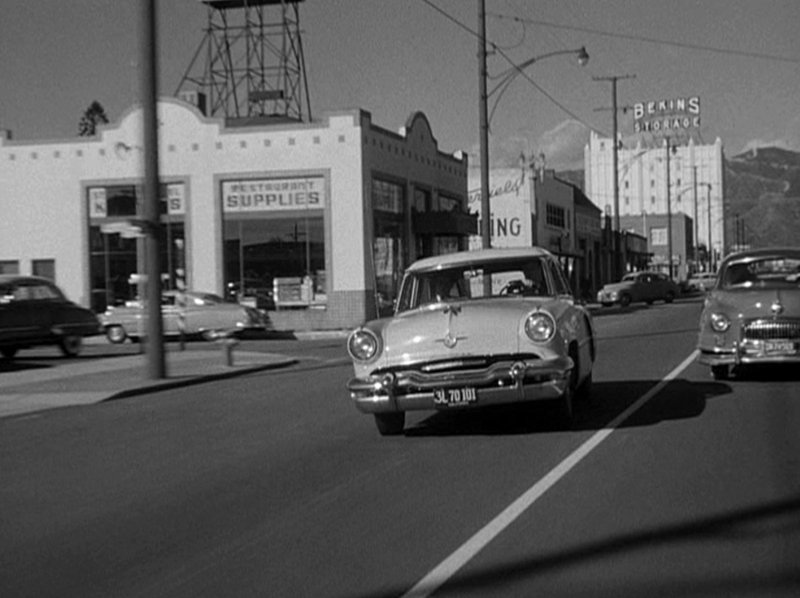 The sunlit exteriors are pure documentary naturalism: showing LA locales (Burbank, Glendale, downtown) in a blunt, “this is the city” fashion. It’s difficult to follow the movie during these scenes; one’s inclination is to instead focus on signs and landmarks, trying to get a feel for the way the streets, the people, and the cars looked during those spectacular post-war years. 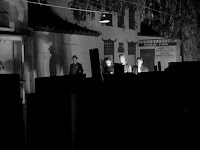 At night, Glennon goes for drama, placing klieg lights in off kilter spots to create a chiaroscuro effect that seems as contrived as the day shots seem real, yet somehow it works, and the transitions barely register. However the scenes are staged, the greatest thing about Crime Wave is where they are filmed: on location all the way through — and not just the exteriors. De Toth somehow swung access to city hall; the homicide bureau scenes are the real deal. 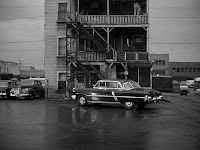 Crime Wave is a superlative example of the way in which a low budget feature could be extraordinary: without money to build sets or dictate production values, De Toth was forced to find locations for the film, and it’s clear after just a single viewing that he had a peculiar talent for doing so: Crime Wave is one the most attractive, maybe even exhilarating, film noirs ever made. Hit the pause button on almost any frame, and you’ll find something to linger on. 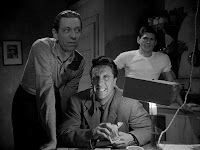 De Toth successfully captured all of the content tropes and moviemaking techniques that had become germane to film noir in this tiny little film. It’s astonishing that he did it with only half of his promised budget, and in a shoot of only thirteen days. 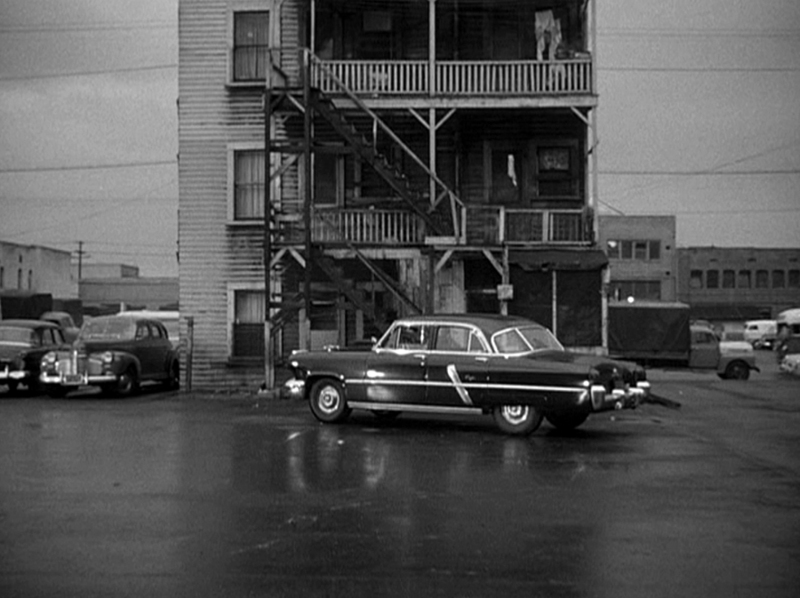 The location work of The Naked City, the backseat point of view from Gun Crazy, the tones of John Alton, the jittery handheld cameras, semi-professional actors, and the quagmire of the ceaseless urban landscape. This a mean, unglamorous movie — populated with Dudley Smith cops ready to shoot a suspect in the back, hard-boiled killers, damaged goods, floozies, stool pigeons, strongarms, and professional losers. The good, the bad — even the insane — all trying to claw their way through a world that no longer gives a damn. It’s a cheap, but delicious buffet of everything noir buffs hunger for — and the final few frames make for one hell of a dessert. It should be on many of those ubiquitous top-ten lists, but the guy beside you probably still hasn’t seen it. Mark, it really is great stuff. I ought to watch it again to hear that commentary. Hayden is definitive and that opening robbery is stark stuff. 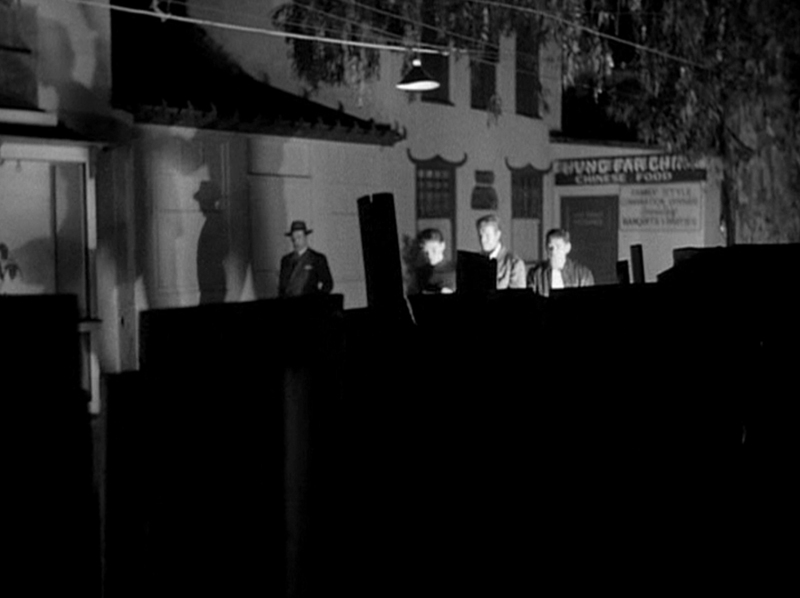 Crime Wave belongs on any list of essential noirs. A truly wonderful (and accurate) review, Mark! This film truly is everything you say it is, and I've been feverishly recommending it to friends ever since I viewed it in Volume 4 of the 'Film Noir Classic Collection' (and the Muller/Ellroy DVD commentary is a complete riot in itself!). 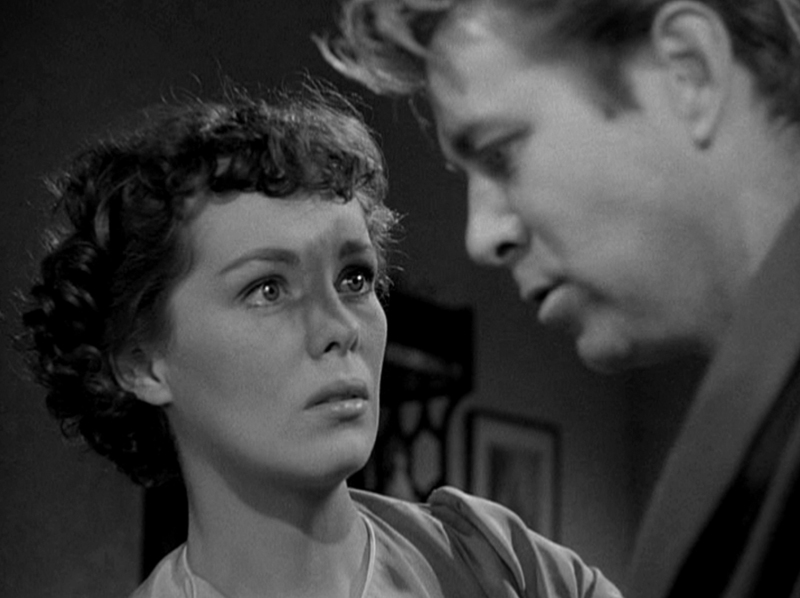 Agreed: Sterling Hayden's best performance, amidst a solid list of terrific performances. Thanks Uncle Sam and Johnny, I really appreciate the comments. It just occurred to me that this was the first time I've ever actually listened to a DVD commentary! I'm sure that I'm unusual in that regard, but I've never been drawn to them. In this instance I heard the back and forth between Muller and Ellroy was entertaining, so I thought I'd give it a go — now I think I'll go back through my DVD collection and see if anything else prods at me. Excellent review which made me watch the dvd again. Even though I've seen this film a few times, it still grabs hold and won't let go until the end. 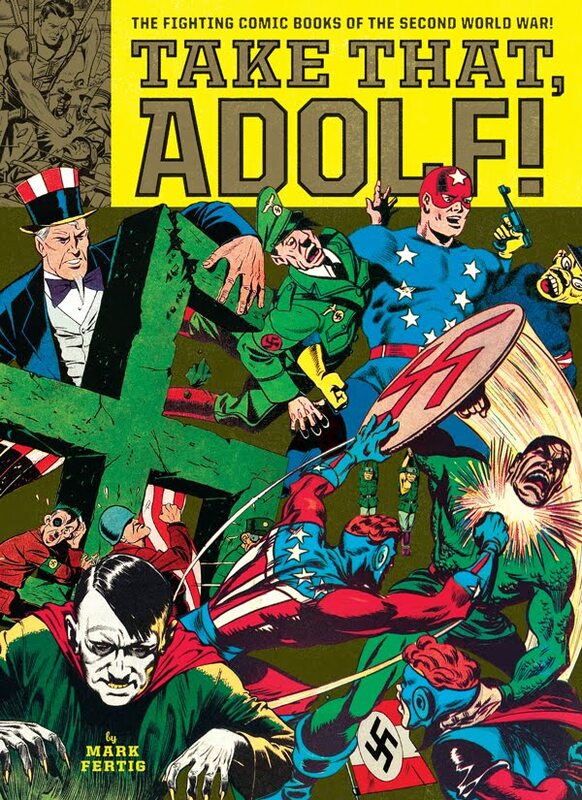 Ellroy's commentary sounded like one that Tim Carey might give for the movie. You got that right Walker, I knew it was going to be a bizarre ride when J.E. started panting into the microphone! I always enjoyed Sterling Hayden so can't wait to see this, thanks Prof! And it has Timothy Carey: going to the top of my list. Alex, I'm sure you'll love it! Hi Mark, thank you for your visit and comments on my latest post. I haven't stopped by in far too long, but since my last visit I updated my monitor. I can now see your blog header in all its colorful full-screen glory. Your reviews are intriguing as always; keep up the great work.